The betfred.com Temple Stakes takes place at Haydock Park on Saturday, May 26, and 31 high-class entries are revealed today for the £80,000 contest. Run over five furlongs, the Group Two event is the first race in the sprint division of the QIPCO British Champions Series. Last year’s contest was won by the Irish raider Sole Power and his trainer Edward Lynam revealed today that the five-year-old is highly likely to return to Haydock Park to defend his crown. 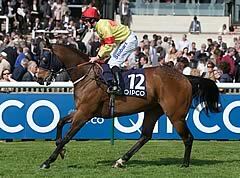 The son of Kyllachy, who also won the Group One Nunthorpe Stakes at York in 2010, has been campaigned internationally on his four latest outings, finishing an excellent third to Tangerine Trees in the Group One Prix de l’Abbaye at Longchamp in October, while on his latest start he took the runner-up spot in the Group One Al Quoz Sprint at Meydan, Dubai, on March 31. Lynam said: “Sole Power will run in the betfred.com Temple Stakes depending on how the weather goes in the next couple of weeks. The horse is in great form and we are preparing him for Haydock Park. If the ground is fast, we will be there. “He has been in very good form. He got first-class treatment out in Dubai and travelled back fairly well. He did us proud out in Dubai and we were very happy with him. He ran very well last season too and has been second and third in two Group Ones since his victory in the betfred.com Temple Stakes last year. He is competing at the highest level all the time, so it’s hard, but he’s in great order and is running to his rating of 115 so we can’t ask much more of him. “The five furlongs at Haydock Park suits him and as long as we don’t get the Irish weather over there he should be fine. Among Sole Power’s potential rivals in the betfred.com Temple Stakes is his Prix de l’Abbaye conqueror, the Bryan Smart-trained Tangerine Trees. The seven-year-old was also successful in the Group Three Palace House Stakes at Newmarket in 2011 and Smart is eyeing the betfred.com Temple Stakes as the first target of 2012 for his stable star. The North Yorkshire handler said: “Tangerine Trees will have his first outing of the season, all being well, in the betfred.com Temple Stakes. “He has put on some condition over the winter and looks strong and fit so I’m very happy with him. “His progress last season didn’t surprise us at all. We have always thought he was a group horse, even as a two-year-old, but he never did it. He has had the time to develop, the owners have been patient and it has proved them right. Other leading contenders include Bated Breath and Hoof It, who finished second and third respectively in the Group One Betfred Sprint Cup (the highest-rated sprint run in Europe during 2011) over six furlongs at Haydock Park in September behind last season’s champion European sprinter Dream Ahead. Several of the entries for the betfred.com Temple Stakes lined up in the Group Three Pearl Bloodstock Palace House Stakes over five furlongs at Newmarket on May 5, when Mayson prevailed by three-quarters of a length from Definightly with Elusivity back in third. Another exciting entry is Prohibit, who was a real star for his trainer Robert Cowell last season when winning the Group One King’s Stand Stakes at Royal Ascot. The betfred.com Temple Stakes is one of the first major sprints when the three-year-olds take on the older horses and the entries from the Classic generation include Bapak Chinta, trained by Kevin Ryan and successful in the five-furlong Group Two Norfolk Stakes at Royal Ascot last season, as well as the Ed Dunlop-trained Burwaaz, who ran numerous good races in Group company during 2011 and recent Bath winner Lethal Force who finished fourth in two Group Two races last year. Five-day confirmations for the betfred.com Temple Stakes must be made on Monday, May 21, when there is also a £4,000 supplementary entry stage. Haydock Park stages a seven-race card on Saturday, May 26. In addition to the betfred.com Temple Stakes, the card also includes the £60,000 Betfred Silver Bowl over a mile, one of the season’s richest three-year-old handicaps. Haydock Park also races on Thursday, May 24 and Friday, May 25. There is also an exciting seven-race mixed card at Haydock Park this coming Saturday, May 12, which features the £55,000 Grade Three Pertemps Network Handicap Hurdle over two miles and the £33,000 Listed Network Group Spring Trophy over seven furlongs on the Flat.